Hawaii Native Status: Introduced. This naturalized ornamental garden plant is native to Asia. Description: The showy, drooping, up to 1 foot (30 cm) long flower panicles are at the tips of the pseudostems and resemble ropes of cultured mussels with pink and white shells. 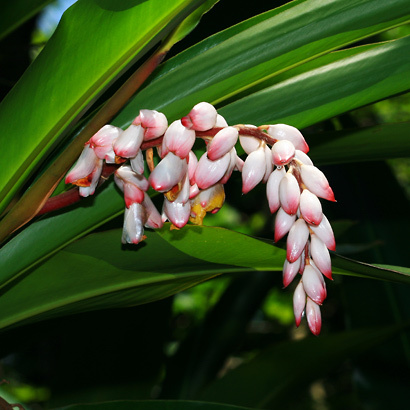 The waxy, shell-like flower buds are shiny white and tipped with pink. 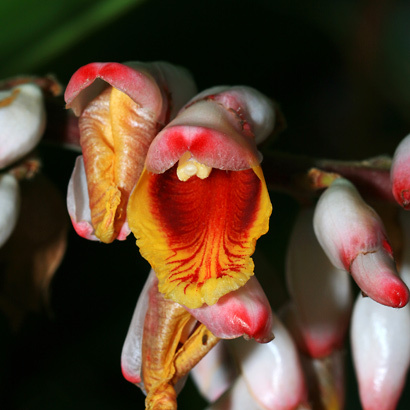 When open, the flowers have a red mouth and red-veined, yellow lips. The flowers are followed by round, ribbed, hairy, vermilion, 3/4 inch (2 cm) in diameter seed capsules. The leaf blades are solid green or variegated green and yellow, up to 2 feet (61 cm) long, and lanceolate in shape with pointed tips. The stout, upright pseudostems (formed by the leaf sheaths) emerge from underground rhizomes. This attractive, commonly cultivated plant occasionally escapes from cultivation in wet to mesic (moderately wet) areas. 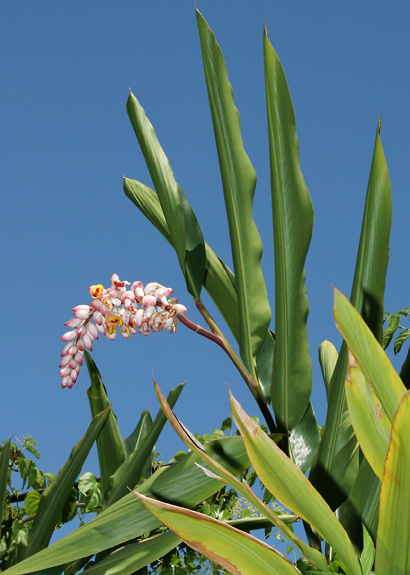 The leaves and flowers can be used in tropical flower arrangements.